As the world moves into the Information Age, globalization continues to alter the customary relationships among peoples, societies, and nations that evolved during the Industrial Age. Author Daniel Gerstein, however, maintains the United States still follows an Industrial Age framework for national security. Unfortunately, due to sales rights restrictions, we cannot offer Leading At The Speed Of Light for sale in your country. As the world moves into the Information Age, globalization continues to alter the customary relationships among peoples, societies, and nations that evolved during the Industrial Age. Author Daniel Gerstein, however, maintains the United States still follows an Industrial Age framework for national security. Despite such recent changes as creating the Department of Homeland Security and the post of a director for national intelligence, the current U.S. national security strategy remains based on the National Security Act of 1947. 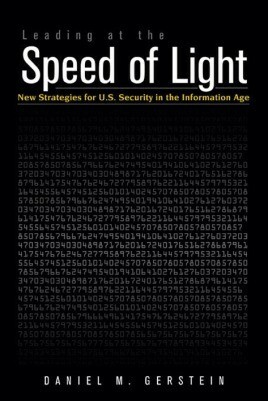 To advance the U.S. response to the particular demands of the Information Age, Gerstein proposes nothing short of overhauling our nation's security strategy and, more important, complementary changes to the U.S. approach to strategic leadership. Beginning with the foundations of leadership, Gerstein addresses four key abilities that the twenty-first-century leader must master for the Information Age: (1) to develop and communicate a vision, (2) to incorporate new tools for analysis and for enhancing the leader's judgment or reasoning skills, (3) to gain greater perspective in developing national strategies, and (4) to promote the three I's—imagination, innovation, and initiative. While theories and accepted methods of leadership remain relevant, they must be augmented with new and improved concepts. The fundamental premise of Leading at the Speed of Light is that leadership skills will require changes and enhancements to ensure that leaders are capable of performing in a data- and information-rich environment that is often uncertain and challenging.